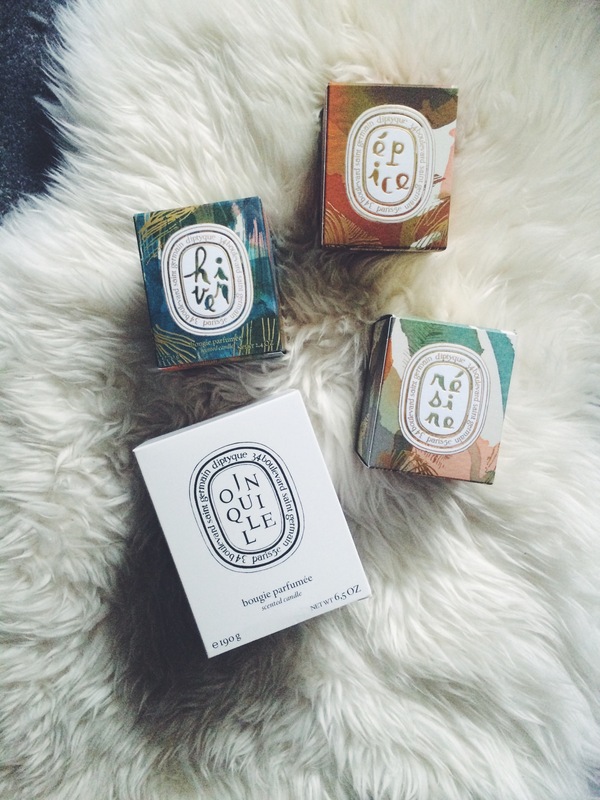 I was first introduced to Diptyque candles by my friend Jess from Rose & Fig. At first I was kind of skeptical about a $60 candle and thought it was a little ridiculous, but after hearing her rave about them I ended up getting 2 as birthday gifts to myself and fell in love with them. 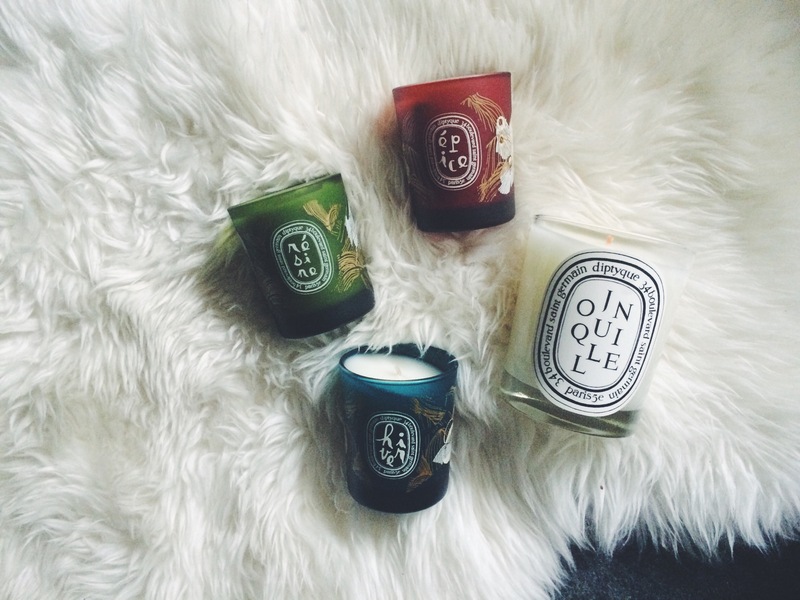 I recently finished the last bits of my Baies candle from my first purchase more than a year ago, and just when I was contemplating on if I should purchase another one right away or wait till the holiday I found out that Diptyque was on sale at Hautelook, so I immediately hopped online to purchase some. I ended up getting the 3 holiday scents they came out with last year – Hiver (winter), Epice (spice), and Resine (pine) – in minis, and a regular sized Jonquille (daffodil). It’s really tricky to buy candles online since you can only read about how they smell like instead of actually smelling them, but to my relief I love the scent of all 4 candles I got. They’re all smell amazing, even without burning. The packaging for them are beautiful as always! 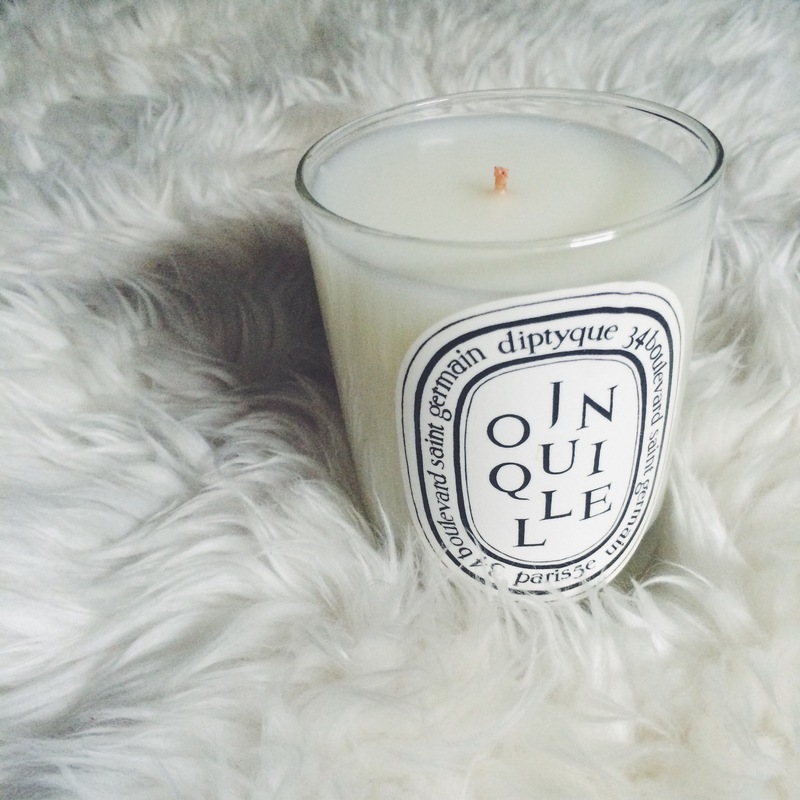 The Jonquille is the standard Diptyque candle holder, clear glass with white decal and a great size that will come in handy as a holder for your makeup or brushes later on. And can we just take a moment to admire the gorgeous packaging for the minis? They are last year’s holiday edition so they have a different design compare to their standard candle – Colored glass with gold accent and white logo. Seriously, they are just too beautiful. I purposefully purchased the minis instead of the regular sized ones because I prefer the design of them more (buying things based on their packaging… very typical of me). They would be beautiful to put around the house, and since they’re small you won’t have to worry about the colors being too obtrusive. Once they’re done burning you can use them to hold your cotton buds, bobby pins, put a tea light in for some ambient lighting in the room or simply leave them as is. Regardless of where you put them, they would be a nice addition to any room! I’ve been keeping them in their boxes because I’m waiting till after I move to my new apartment to start burning them, but I cannot wait! Overall I’m happy with this purchase, but not exactly thrilled about the quality of product I received. As you can see the surface of all candles are slanted, like they were melted and re-solidified at an angle. I assume this was either due to poor quality control or heat during transport, nonetheless it’s annoying. At least my purchase was for personal use and I can overlook the imperfections (once the event ends they can’t request more items from the vendor, therefore you cannot do an exchange if your order is damaged, only refund), but if I was purchasing these as gifts I don’t think I would be comfortable gifting them because they look like something you’d pick up from the clearance section because they were damaged… Just something to keep in mind when shopping on sites like this.